David G. Myers is an internationally renowned scientist, author, and teacher whose research and writing have covered a wide range of topics, including group behavior, prejudice, personality, religion, intuition, hearing loss, and personal well-being. Over the past 35 years he has published 18 books—several of which are best-selling textbooks in their 8th, 9th, or 10th edition—and dozens of scientific articles in leading journals such as Science, Psychological Bulletin, Psychological Science, and the American Psychologist. He has also served as consulting editor to the Journal of Personality and Social Psychology, the Journal of Experimental Social Psychology, and the Journal of Positive Psychology, and he is a Fellow of the Association for Psychological Science, the American Association of Applied and Preventive Psychology, and Divisions 1, 2, 8, 9, and 36 of the American Psychological Association. 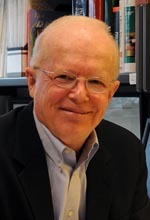 After earning his Ph.D. in Social Psychology from the University of Iowa in 1967, Dr. Myers joined the faculty of Hope College, where he has been Director of Educational Research, Chair of the Psychology Department, and a member of the Board of Trustees. His research has been funded by the National Science Foundation and the National Institutes of Health, and his contributions to psychology have been recognized with the Gordon Allport Intergroup Relations Award from the Society for the Psychological Study of Social Issues (APA Division 9) and the Award for Distinguished Service to the Field from the Society for Personality and Social Psychology (APA Division 8). In 1989, Professor Myers and his wife created the David and Carol Myers Foundation to support nonprofit organizations within and beyond psychological science. The Foundation receives all author royalties from Professor Myers’ introductory psychology textbooks and all royalties from his general audience trade books. Its grants include a $1 million endowment to establish the APS Fund for Teaching and Public Understanding of Psychological Science, grants to local community organizations, funds for international hunger relief, and various other projects. The Dave and Carol Myers Foundation has also provided generous support to Fabbs to support its educational mission. In addition to making these and many other grants, Professor Myers has chaired his city’s Human Relations Commission, helped found a Community Action Center that assists poverty-level families, and advocated a transformation in assistive listening for people with hearing loss (HearingLoop.org), thereby providing a model of how psychological science can be placed in the service of society. * The FABBS Foundation would like to thank Dr. Scott Plous and Dr. Steven Spencer for nominating Dr. Myers for this honor and for leading the effort to spread the word about his nomination. It isn’t too late to have your name added to the list of donors! You can make your donation to Dr. Myers’ In Honor Of… campaign at anytime.